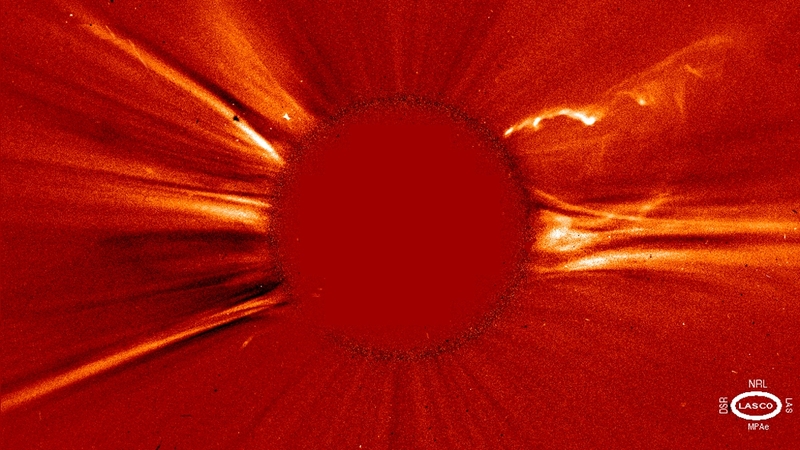 LASCO C2 image of coronal streamers and a filament eruption taken on 21 August 96. In this picture of the normal K-corona (or electron corona, seen by the eye at eclipses), we see bright streamers on the east (left) limb, which are extensions of the faint, stream-like features seen in the C1 images. On the west (right) limb, the equatorial 'streamer,' quite usual at this time in the sunspot cycle, has brightened suddenly, with outward-gushing plasma, while above the horizontal streamer, a twisted mass of ionized gas, expelled from the lower atmosphere, and contorted by the magnetic fields that hold it together, is seen stretching across the field of view, from somewhere beneath the occulting disk, out to more than three million kilometers above the Sun's visible surface.